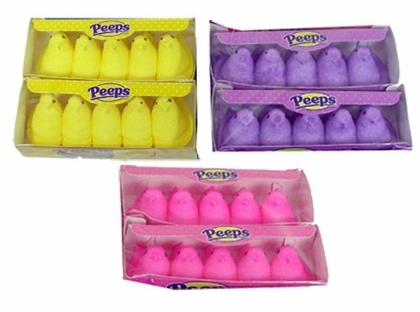 While Peeps are available year-round and in a variety of holiday shapes and colors, they truly shine at Easter time! They’re a classic Easter candy, after all! Here at Blair Candy, we believe that peeps are delicious all on their own, but there are some very fun ways to spruce them up. Check out these Peepin’ recipes! Fresh fruit of your choice – the more colorful, the better! Poke the Peeps and slices of fruit through the skewers, alternating between types of fruit and Peeps. In a large pot, melt the butter over low heat. Add peeps and stir until melted. If using different colors, separate them into different pots to melt. Add Rice Krispies cereal to the Peep and butter mixture and mix well. Press the Peep and cereal mixture into a pan or cake pan. If using different colored Peeps, mix together. Pour a small amount of vanilla syrup on a flat plate and pour the sugar on another. Dip the rim of the glass in the syrup and then into the sugar for a sugar rim. Pour vodka, syrup, and cream into a cocktail shaker with ice. Nothing screams “Easter!” quite like a delicious handful of jelly beans, don’t you think?! Kids and adults alike love munching on these little sugary sweet treats, full of both sweet and savory flavors. While fruity tends to be the classic go-to, candy producers such as Jelly Belly have been a bit more creative in their tastes, with flavors such as toothpaste, glass, and lint! 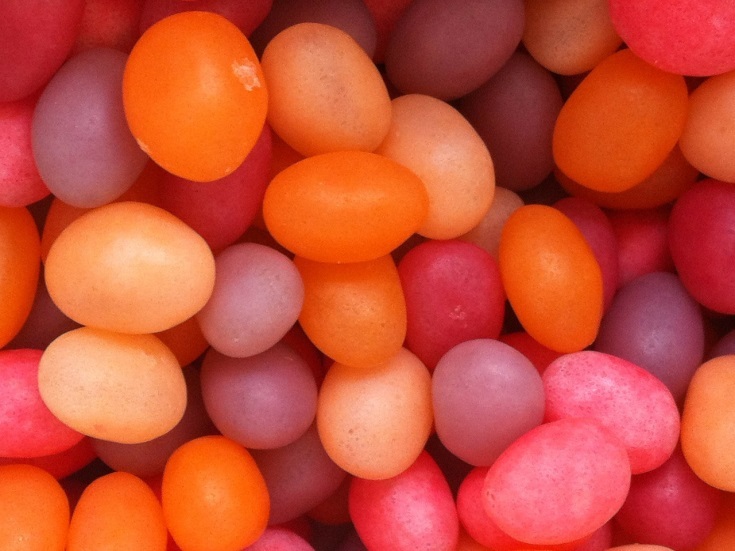 Throughout the centuries, jelly beans have taken many forms before becoming what we know today. In ancient Rome, Turkish Delights were comparable to today’s modern jelly beans. Turkish Delights were made of a jelly-like sugar and rosewater mixture coated with powdered sugar. Over the decades this recipe was adapted to include different flavors and ingredients. Somewhere in history – though it is unknown where – a candy coating was introduced, which paved the way for jelly beans as we now know them. Americans first began munching on today’s modern jelly beans during the Civil War when they were commonly sent to soldiers as a sweet (un-meltable) treat. In the 1930s, jelly beans made their way into Easter baskets. They were small, flavorful, and again, didn’t melt, making them the perfect spring-time treat! Today, Americans consume close to 16 billion jellybeans at Easter time. While the true history of jelly beans remains a mystery, there’s no denying that we sure do love this classic Easter candy!